There are two things I always count on in March. The inevitable (and possibly last of the season) Chicago snowstorm and the International Home and Housewares Show at McCormick Place. This year we were lucky that the snow had melted by the time the show began. My daughter Kristina have been attending the show for years and get excited about it every time. 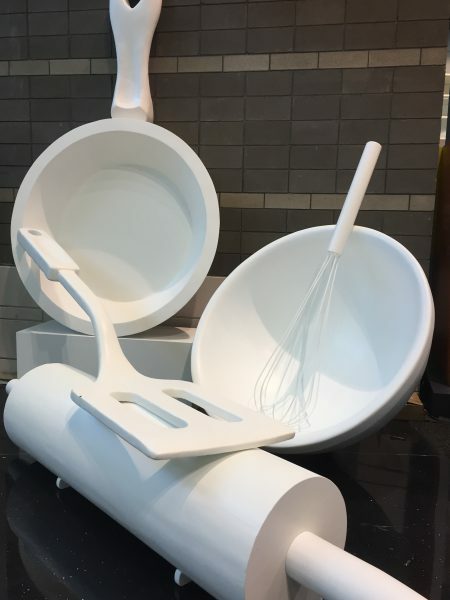 Another thing we always count on is seeing the giant cooking utensils. Everyone loves these. There is usually someone taking a selfie or video in front of them. 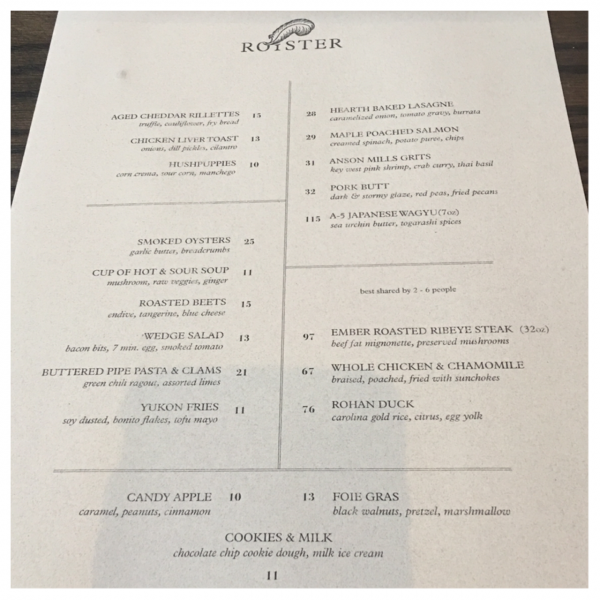 We arrived one day early because Kristina managed to get us reservations at Grant Achatz’s newest restaurant, Roister. 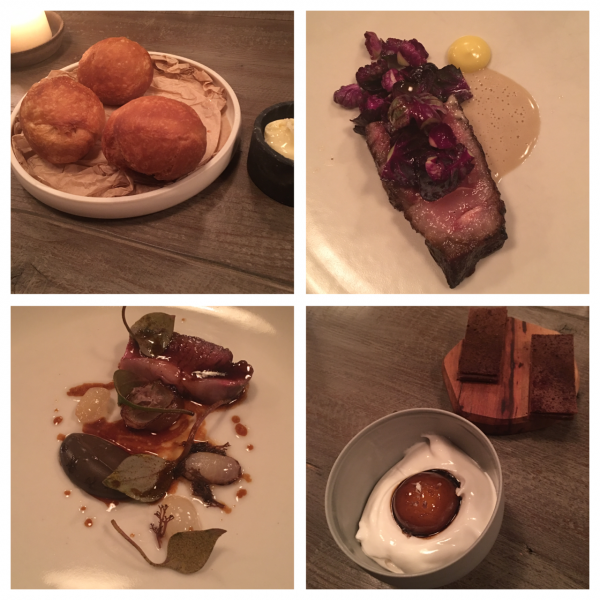 It’s casual and definitely less expensive than his two others, the incredible Alinea and Next. Roister happens to be right beside Next on the same block. 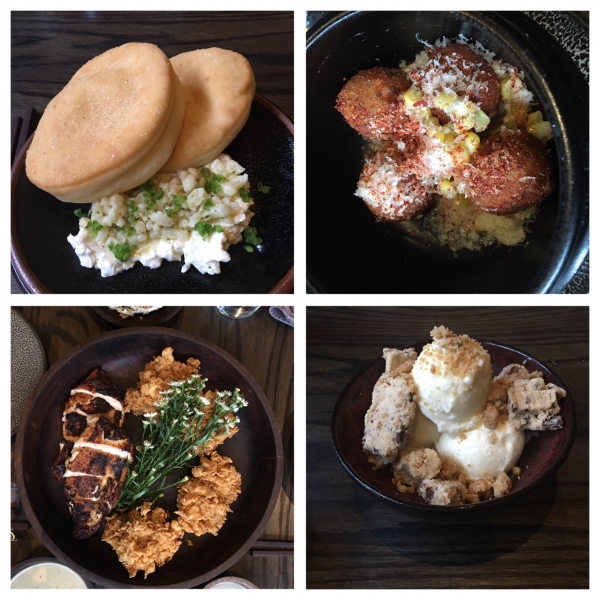 Kristina and I selected the Aged Cheddar Rillettes to start (top left) and the waiter also brought us a surprise, the Hushpuppies. Both were wonderful. For the entrée we decided to try the Whole Chicken and Chamomile, as it was a dish to be shared. It was the most perfectly cooked chicken made several ways, braised, poached, fried, and in a salad. Incredible. We shared the dessert of milk and cookies. Fun and delicious. We fell asleep fairly early because we wanted to be up and ready to go at 8 am for the two-hour preview of new exhibitors, separate from the large showrooms that didn’t open until 10:00. I found two new favorites. 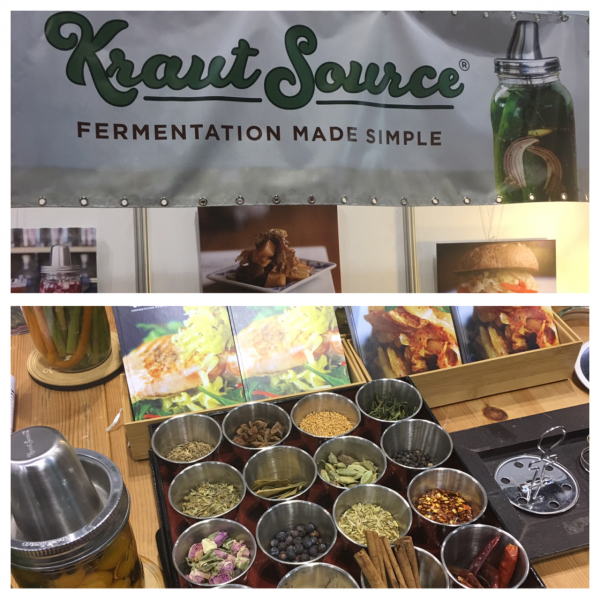 If you keep up with food trends, fermentation is hot, which means you want to know about Kraut Source. 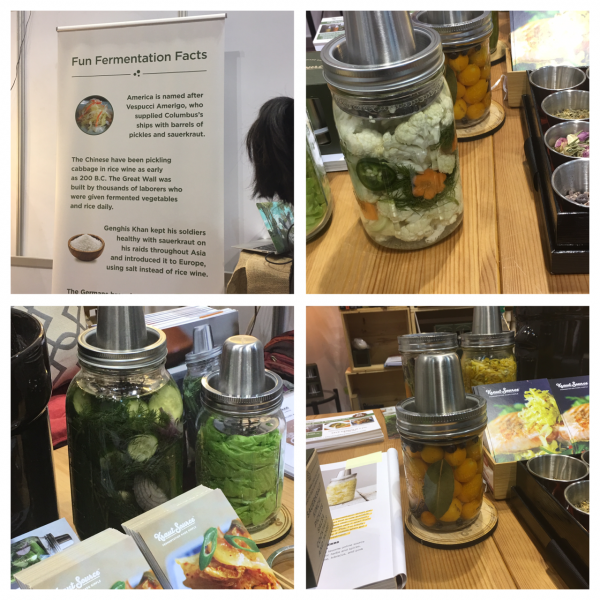 Fermented foods are so popular because they are extremely healthy, providing fiber, improving digestion, many of the food items contain choline, vitamin C, K, B, and minerals; helps with detoxification, cancer prevention, and energy production. I received the basics needed to start fermenting along with a wonderful recipe booklet. I can’t wait to get started! Another favorite item was the Bee’s Wrap, a natural alternative to plastic wrap. Made in Vermont, organic cotton is infused with responsibly harvested beeswax, organic jojoba oil, and tree resin, to produce food storage wraps that are durable, washable, and reusable. 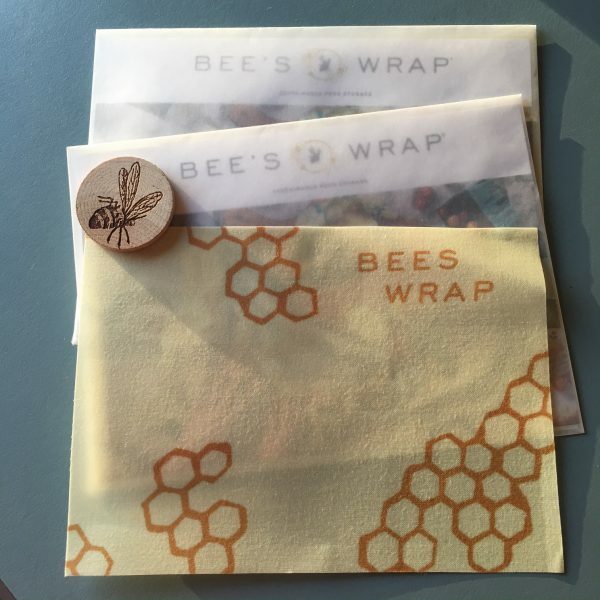 Bee’s Wrap is easy to care for and use and imbued with natural antibacterial properties – and no more plastic! It comes in all sizes and designs. You can even wrap an entire loaf of homemade bread. I was sold! 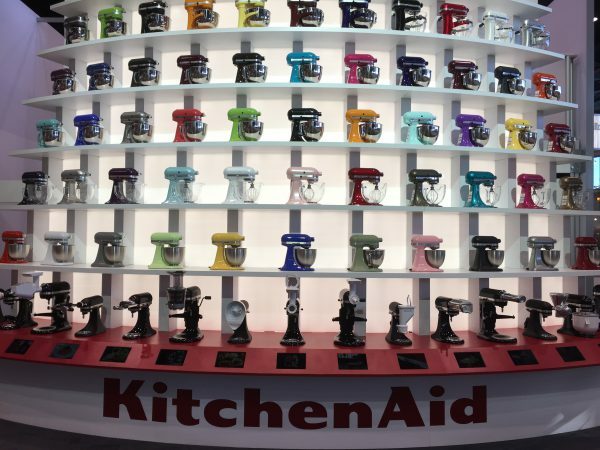 My next stop was KitchenAid where I must take a photo of the mixer wall every year. I love the set-up with all the colors! 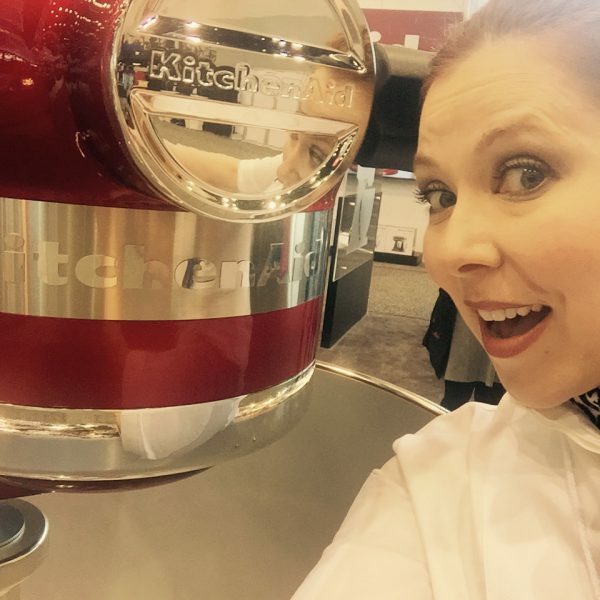 There was a new surprise at KitchenAid this year, a 6-foot stand mixer! Kristina took a selfie with it. I always check out Nordic Ware, which occupies a very large corner of the showroom. They have so many items to see. I couldn’t begin to take photos of everything. Here were some of my favorites. 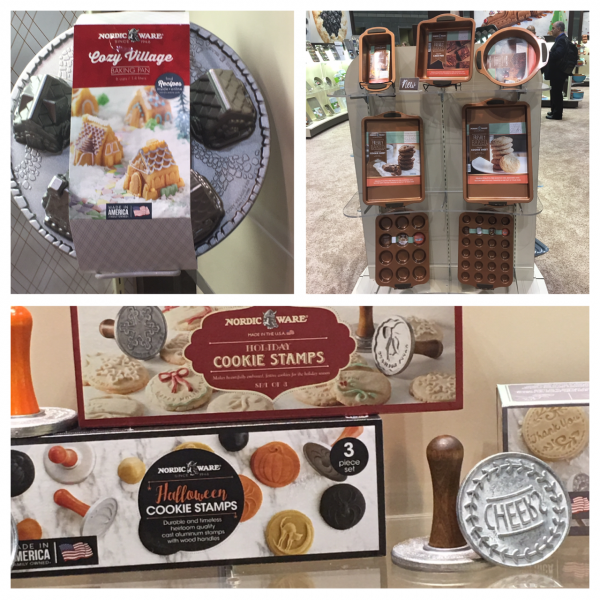 I loved the Cozy Village bake pan, the beautiful copper looking nonstick bakeware, and I always love cookie stamps. There were stamps for just about every holiday. Another one of our favorite stops is Cuisinart. I have so many Cuisinart items, I could start my own store. Look what I found for my new granddaughter! 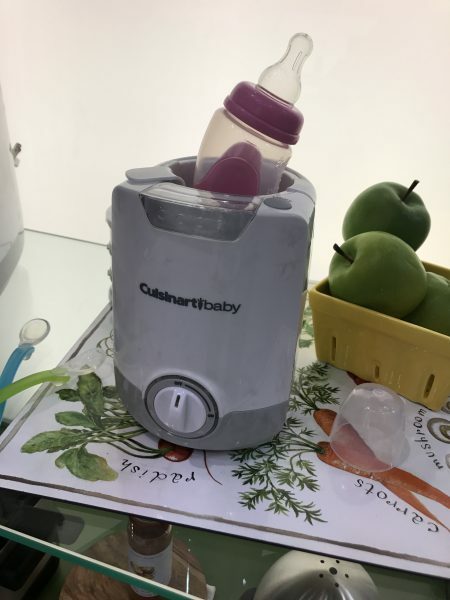 A sterilizer that I bet her mommy will love. After a long day, Kristina and I look forward every year to our special dinner with our Cuisinart friends. Each year is a new and exciting restaurant, this year being Smyth and the Loyalist. We enjoyed the company of our lovely and charming hosts, Dan and Rachel, and other interesting media people we look forward to meeting every year, some new, some old friends. 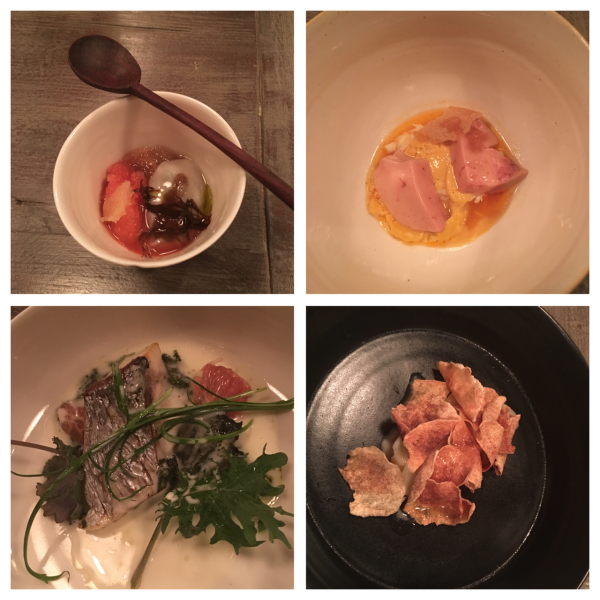 We were delighted to be served an incredible tasting menu. First up (top left) was a salted and frozen radish, oyster, and seaweed. Next was Dungeness crab and foie gras with scrambled kani miso. The shima aji seasoned with its fish sauce and spicy plants was so flavorful, followed by another seafood dish, caramelized potato and sunchoke with dried scallop and trout. No – not over yet. The piece-de-resistance had to be the brioche doughnut with aged beef au jus which sounds strange but it was beyond delicious… It was followed by prime rib eye of beef, wasabi, and brussels sprouts. After the beef was pickled onions with lamb, black allium, and black truffle. The round object was an egg yolk soaked in salted licorice nestled in a frozen yogurt meringue and served with a milk chocolate, huckleberry, and preserved shiitake mushroom. Yes, they blended beautifully even if it sounds strange. 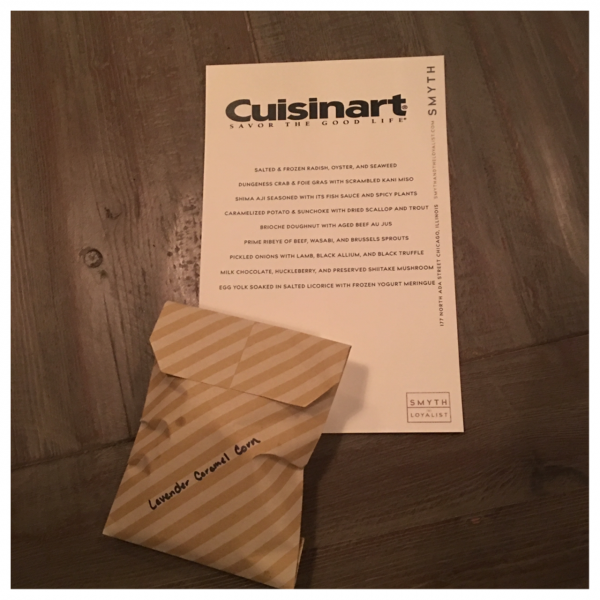 Our going away gift was the menu we had just experienced, plus a bag of Lavender Caramel Corn that I must tell you was heavenly. Just the right hint of lavender. 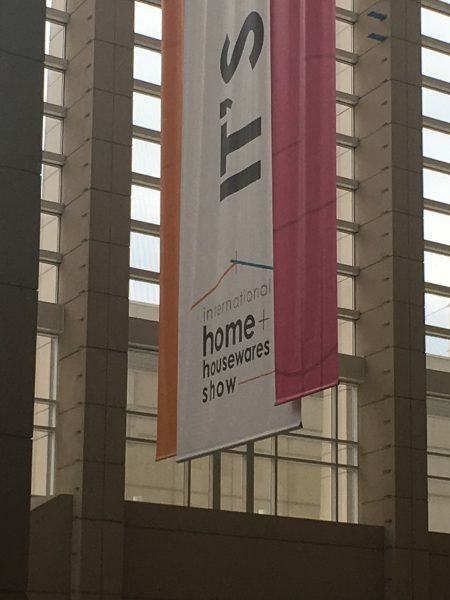 Kristina and I left the Housewares Show happy as always, and already looking forward to next year. Now it’s time for another adventure which you will just have to watch for in the next several days. More fun ahead! What an unbelievable time with so much to see & so much to savor! No wonder you girls look forward to this amazing experience every year. A cook & foodies dream! 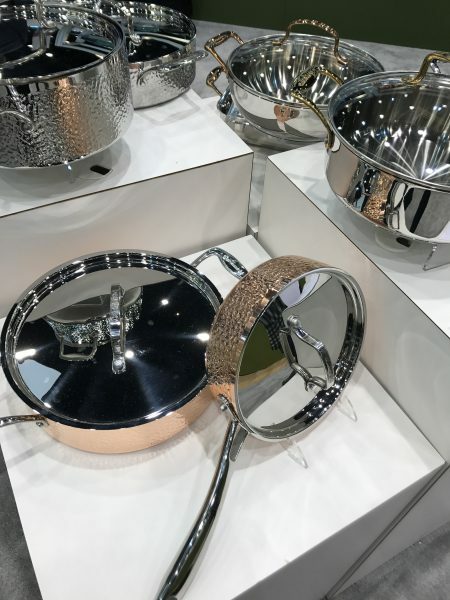 It is a cook’s dream! You would love it!